This fine looking Kukri machete is designed to put the fear of God into anyone or anything that has the intent to hurt you. It definitely looks mean and dangerous too. But does it have what it takes? Let us take a look. 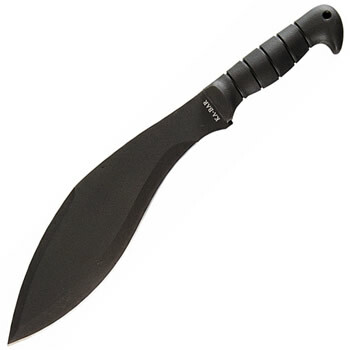 This machete is made for outdoor use, and it is very versatile due to its size and strength. You can use it to cut down a tree, make a fire or open yourself a path through the jungle. It comes with three carrying options and all the necessary gadgets to hook it up to your belt; strap it on your leg or carry it on a sling on your back. The strong nylon sheathe is sown together and is reinforced with tough rivets that will hold it in place during your travels and country expeditions. The SCHKM1 has a four millimeter, thirteen point three-inch blade made of very hard, powder coated 3Cr13 stainless steel, it is completely rust resistant but with time it will lose the powder coating and start to rust. Good maintenance and cleaning practices will extend its life forever. The blade is curved downward to provide greater impact strength and better handling and aim. It also has a large area near the grip which is not sharpened in case your hand slips so your hand remains protected at all times. It is heat tempered too so it can be used over and over again without losing its sharpness. 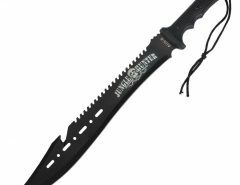 Overall the machete measures nineteen point seven inches including the handle which is made of hardened; rubberized plastic. The Safe-T-Grip handle is laced with miniature lines which improve your grip and is also wider at the bottom to provide better support to the hand and avoid the machete slipping from your hand in any kind of weather. Its ergonometric design fits into your hand like a glove allowing you to use all your strength in striking and not trying to hang on to the SCHKM1. Its curved pattern is also useful to improve your cutting strength and direct each it with greater ease. At the bottom it has a lanyard hole in case you want to install a tether through it. In the nylon sheath Schrade decided to add a couple of gifts to you which include an excellent quality Ferro-rod and striker plus a diamond field knife sharpener. 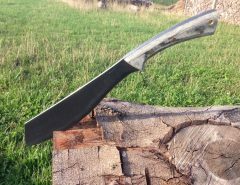 The diamond sharpener is perfect for this machete and will serve you well in the field or anywhere else you need to use it. It’s slanting shape downwards and un-obstructive features help you to aim better at whatever you are hitting and to balance the machete for an even, hard strike every time you use it. We tested the SCHKM1 in the field and both its size and strength are perfect even in closed jungle circumstances. It is easy to handle and to use under any circumstances and the best of all is that it looks and feels great in any of its three carrying positions. It is built to last, but it is your responsibility to take proper care of it and use it safely and wisely. 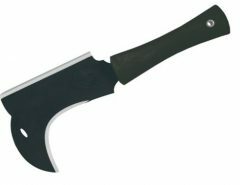 This is the best budget machete option and can be purchased here. 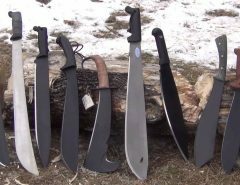 If you’re looking for simply the best machete, check out my review of the Condor Bolo machete and also check out my Best machetes page. 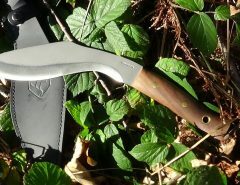 The Bolo is a different type of machete in comparison with the Kukri.